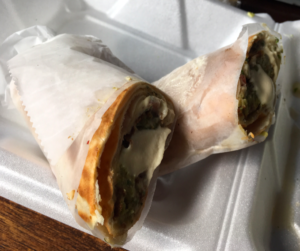 This drab photograph does not do any justice to the absolutely delicious falafel wrap I took out last week from the brand new Nook Eatery at 229 Main Street. Garlicky, crispy/creamy, with just the right amount of lemon-yogurt-tahini sauce. I wolfed down the side salad first, then I wolfed down the wrap. I want more. 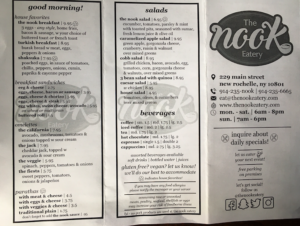 If you like Middle-eastern food (and I love it,) you will want to drop whatever you are doing right away and head over to the Nook. 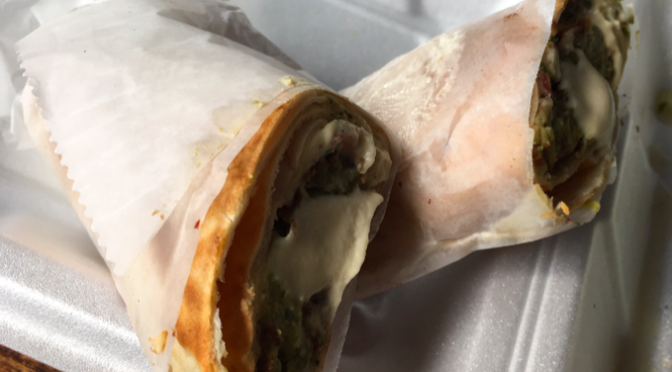 It’s a tiny place, family-owned and managed, in the strip mall across from New Rochelle’s City Yard and Armory. Small size, big flavor. 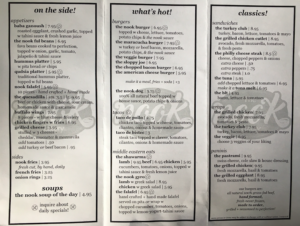 Images of the menu below . . .